The German anatomist Max Westenhöfer (1926), the Dutch obstetrician Klaas de Snow (1937), and the Belgian zoologist Serge Frechkop, were the main proponents of the Theory of Initial Bipedalism, in the first half of the XXth Century. Quadrupedalism is indeed not foreseen in the primitive Mammalian disposition ;therefore it developed itself (like also in the Reptiles) as specialization in food occurred, while remodelling teeth, jaws and skull. Thus, the big-headed embryo of the quadrupedal mammals still shows an organization superior to that will be achieved in adult age, passing through the stage of a biped (with potentially increasing brain capacities ! ), at the beginning of its in utero growth. As the French-Belgian zoologist Bernard Heuvelmans emphasized (1954), the encephalon is compressed in quadrupedal mammals between snout and vertebral column, and consequently does not preserve a shape and a relative volume, like in the foetal stages. The head is then carried in a way that demands re-adapting of the whole skeletton, and supporting of the body by the forelimbs. As a matter of fact, the today quadrupeds were initially, but transitorily, bipedal in the course of evolution. Man, as far as concerned, has retained the embryonic disposition. He remained an upright biped thanks to his well preserved archaic big brain ! Thus, the different types of fossil or contemporary (so-called "relic") hominians and ape-men, appear to be forms which evolved from our direct ancestry, progressing parallel to the humans, and at the same time branching out (dehumanization, i.e : loss of traits that characterize the Homo sapiens). Most of them kept the bipedal gait, although quadrupedalism turned out to be a best adapted feature for them, especially if they lived in forest. Therefore : plantigrade foot, vertebrae and legbone disposition are hindering a faster evolution of the hominians, up to a four-footed stage that seems more convenient for them ! Evolution never goes backward (Law of Dollo). So the French palaeontologist Yvette Deloison (1999) claimed in a recent article that : << It becomes obvious that the ancestor of the australopithecines, apes and man, had hand and foot without specialization : the primitive hand of man induces that his ancestor was neither arboreal nor quadrupedal, he was bipedal >>. The aim of the now following article is to summarize what we mean under the global name of Initial Bipedalism. It begins with the explanation of man’s big brain inherited from a former marine creature, and continues with the signification of "dehumanization", as an evolutive progress. Was man more aquatic in the past ? asked biologist Alister Hardy in 1960. Thus, an ancestral ape that waded in shallow water could not have fitted for "making a human", as Hardy suggested ! Apes are indeed tree-living primates with high specialized features : foot as a lower hand, insert of the vertebral column at the back of the skull, and knuckle-walking on ground which reflects increasing quadrupedal habits. This is the evolutive level obtained by the monkeys of the Old World (Catarhinia) and of the New World (Platyrhinia). Alister Hardy’s "Aquatic Ape Theory" is actually dealing with a phantom (de Sarre 1997). The large globular brain of man is not an indication for simian ancestry... As a matter of fact, it is a real primitive (plesiomorphic) feature that once developed in a marine creature, a long time before the first arborical primates (apes and monkeys) ever existed ! From an embryological point of view, indeed, the brain comes before the skull (brain-pan). That is what makes very unlikely that the "big head" of the Homo sapiens is the result of some "swelling process" in a simian brain (that is confined in a rigid bony superstructure ! ), in the horizontal prolongation of the (quadrupedal) body axis... It does not suit for both a tree-dwelling ape (= current theories in anthropology), nor for Alister Hardy’s hypothetical "marine ape" ! The study of the human morphology must consequently be carried back to a very early stage in the vertebrate lineage, i.e. the time of the passage from an original full aquatic life ("marine homonculus") to a terrestrial existence. The globular form of the human brain -and of the skull- represents the final evolution of an ancient sea-creature’s floating organ resembling the umbrella of a jelly-fish. Such a configuration could only develop naturally in water ! From a scholastic point of view, what we call evolution does not have to follow any aim : we humans got consequently our very "remarkable" features, such as the globular skull and the big encephalon, in a simple way, just like a sea-creature, indeed, did it whilst developing a sustenance organ in water (that evidently only could have got a round shape !). So the globular brain precedes any form of skull or cranian structure among the lineages of vertebrate animals that followed the "homonculus", i.e. : the arborical and quadrupedal mammals, the winged birds, the reptiles, amphibians and even the fish ! Evidence, indeed, strongly suggests that early bipedal mammals have moved out of the oceans, and have evolved the adaptations to terrestrial life. 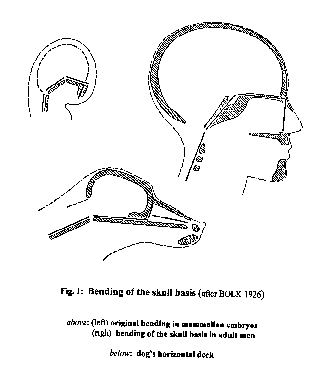 The big brain was a sufficient response to the challenge of settling this new environment : physically, as the volume and weight of the encephalon "locked" the skull basis and the spinal chord into their position where the body got upright whilst standing or walking ; intellectually, as mental powers came into action to serve the developing mind dispositions. As a matter of fact, humanity did neither evolve from a branch of the ape-stock, nor from other quadrupedal antecedents. The genus Homo originated from a lineage peculiar to himself that came up from the ocean in remote times [the palaeontologists use the name Homo to specify some creatures like H. habilis or H. rudolfensis : for sure, I only use this appellation in Linnaeus’ mind, i.e. regarding Homo sapiens, with his big encephalon and erect stature !]. Humans are indeed, among the vertebrates, the least removed from the ancient prototype, morphologically and anatomically. Man preserved the original orthograde body position of his lineage. This bipedal, former aquatic, form was not only man’s ancestor, but also the ancestor of all the today living -and extinct- mammals, of the birds, reptiles, batracians and of the diverse water vertebrates. If "classical" Zoology is to continue considering fish as the primordial vertebrate, then it is simply a matter of usage... ! Man, in the rôle of his own classifier, has set himself at the summit of the hierarchy : the animals morphologically the closest to him appear as the different stages through which the humans have "passed" to reach their present appearance... [what we call : modern man]. This accounts evidently for the fact that most of the scientists still believe that we developed from apes, from quadrupedal reptilians, and furthermore, from some fish-like creatures that once have heavily entered land. - This is but grand-pa’s Zoology ! Zoologists as professor Wolfgang Gutmann and his scholars (Senckenberg-Institut in Francfort) were always warning against misplaced confidence in the fossil records. These German zoologists have established a natural system of all animals without making allusion to the palaeontological datae. There are indeed no "lower" or "higher evolved" animals :they all originated from the gallertoids, which developed themselves in diverse ways, introducing the numerous lineages : sponges, polyps, arthropods, molluscs, and even the vertebrates. We notice the important feature of a dorsal protochorda (sustaining the body structure) with the nervous system included in it, then the disposition of the muscles, and the abdominal (coeliac) cavity in which the absorbed water from the branchial pharynx poors down to the branchial and genital porus, after eventually melting with the genital products (that are loosened into the sea for reproduction). The farther phylogenetical history of this marine worm, which may have evolved into the first four-limbed vertebrates with a round skull configuration, is summarized on fig. 3. Man’s large and globular brain represents the final evolution of a marine animalcule’s floating and sustenance organ. 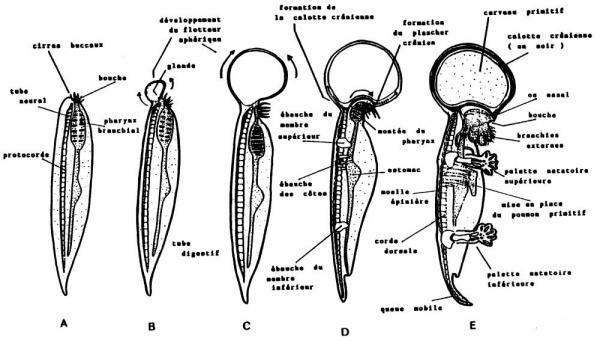 A-B) : The floating organ developed on the apical top of the marine worm’s body, just like a "bubble" at the above part of a straw, or the umbrella in some medusae, intendedly filled with gas to facilitate an "up and down" swimming. 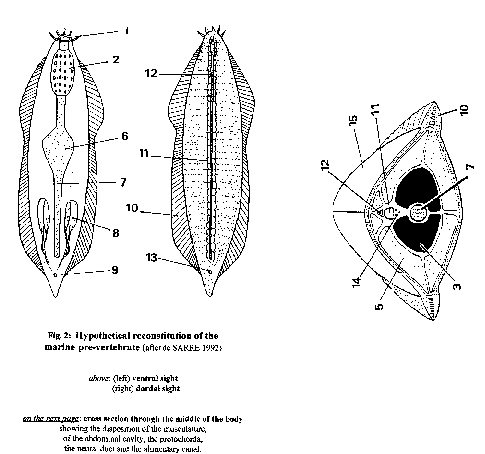 C) : The globular sustenance organ becomes functional in the same way as, for instance, the natatory bladder of a fish. D) : Here is the consolidation of the bladder-walls through the insert of a mesodermal membrane between the inner ectodermal bag and the outer skin the mesodermal cells originated in the protochorda) ; it was this that shaped the round configuration of man’s skull ! E) : The "marine homonculus" with his four limbs, and a little tail that functioned as a rudder, then started to develop a big brain (the neural cells originated from the spinal chord medulla)and the upright posture, evolving into the first, ever terrestrial, air-breathing vertebrate. As a matter of fact, the skull of the cetaceans is being deeply transformed, consistently with the external "fish" form. Therefore, the large and efficient encephalon remained quite undamaged, not far different of a human brain. The early land-dwelling vertebrates had, as we emphasized, a natural orthograde body position that hindered them to run on four legs, even if they should have liked it. Referring to Louis Bolk (1926), the primordial big brain has "locked" the curved end of the vertebral column in its original disposition, just under the basis of the cerebral skull. If humans have remained more or less morphologically and anatomically the same through out the course of geologic ages, this may be due to cerebralisation, which is centered in the brain and acts on a cellular level as regards behaviour and mind, whereas the (nevertheless !) principal evolutive current of dehumanization tends to reduce and to deform the human skull, to change the body aspect, and to engage new locomotory habits (quadrupedalism, for instance !). As Bernard Heuvelmans claimed, these two antagonistic tendencies in the evolution of the primates are still present in the modern Homo sapiens : the second factor (cerebralisation) may contribute to the slowing down and to the restriction of the free development of the first one (dehumanization) ! The key error of many evolutionists still consists in assuming that man descends from quadrupedal animals that resembled monkeys or apes(Aegyptopithecus, Proconsul, Sivapithecus). It inevitably led to the misconception of the phylogenetical tree of man associating fossil apes (like Australopithecus) and some "ape-men". We should better call the last ones : "pongoid men", i.e. they are only "looking like" apes. I mean the erectus-hypodigm, for instance. The current human fossils from the Plio-Pleistocene represent dehumanized forms. Like (perhaps still living) representatives of pongoid wild men around the world, they were sometimes branching off from the central and chief trunk of our sapiens-lineage. The evolutive phenomenon of dehumanization exhibits a progressive loss of the facial and bodily structures (then, the mental abilities) that characterize the Homo sapiens. In his famous book about wild men ("Abominable Snowman, Legend come to Life, 1961), Ivan T. Sanderson let us consider with new eyes the condition of human groups that are rejected into mountains, forests or other inhospital areas. In Norway, some adolescents who had grown up in humid valleys that were nearly always deprived of sun rays suffered from physical degenerations due to the lack of vitamins E and D (produced by sun rays). Suffering from mental subnormality, they had grotesque hairs growing on their head and body, their jaws were very large and irregular. Rejected by the community such people lived in the mountains and succeeded in eking out an existence by hunting small animals by hand. These were eaten raw, as well as vegetables. Within the theoretical framework of Initial Bipedalism, the relic and fossil non-sapiens hominids are considered to have issued from the human line of ascent. They are the representatives of collateral lineages who have survived, concurrently with Homo sapiens, during the prehistoric times (man himself was confronted with survival problems and "forced to return to the caverns"... ! ), or they are still living until the recent time ("relic" hominoids). The typical description is : an upright-walking, hair-covered creature with an ape-like face. It might even be fossil-known species, as I emphasized ; but it must also be assumed that some specimens of wildmen throughtout the world had retreated for a short time from the humain main lineage (i.e., Homo sapiens) : we should consider them as recently dehumanized forms. They sometimes wear clothes and are actually looking more like "true" humans. Then, wildmen are not an intermediate between the animal and human : they are just the opposite ! Most of the wild "relic" hominoids walk bipedally, like many fossil representatives (Oreopithecus, Ardipithecus, Australopithecus) also did. They have apparently some difficulty to get rid of this locomotion feature, that may cause inconvenience for them, in their habitats. The wildman, indeed, must still walk erect, even with a forward inclination of the torso, putting his nostrils very close to the ground, in order to follow the scent of some animal, like dogs would do... Therefore,the wildman cannot put his weight on his hands simply because of his bodily structure. This could only more dehumanized descendants realize ! According to witnesses in southern China, there are creatures that look like terrestrial orang utans. They are said to stand fully upright. Such an erect posture may be considered as simply "deviant" by researchers, but a bipedally adapted orang utan cannot be closely related to the "normal" Indonesian species, which is quadruped, -and a skilled tree-dweller with prehensile feet ! In science, the principle ofOckham’s razor demands thatthe simplest explanation should always be preferred to the more complicated one. And this principle surely advises us that bipedal forms have preceded the today quadrupedal apes, and that the inverse cannot be true. Anyone who has ever observed apes, would not deny it !